This issue features the first interior appearance of the new Brotherhood of Evil Mutants (after appearing on last issue's cover), as well as new member Phantazia (though she has yet to say or do anything), as Toad brokers an alliance with Masque and his Morlocks. The Morlock Thornn, who we'll learn is Feral's sister (they both share a generically-feline mutation), also makes her first appearance. She is presented in this story as being even more intense and irrational than her sister, but later stories will reverse that. 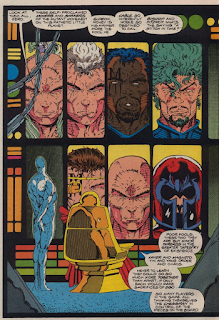 This issue opens with a reminder that Stryfe is still around (and looks like Cable), as he ruminates on the state of mutant affairs and the continued existence of the MLF despite X-Force's attack in issue #1. It's all a lot of vague blathering that mostly just builds up the sense of mystery around the character without really teasing anything specific, but his rundown of the various mutant players does include Fitzroy and Bishop (and, hilariously, Bishop's buddy Malcolm), a nice nod to happenings in other series. 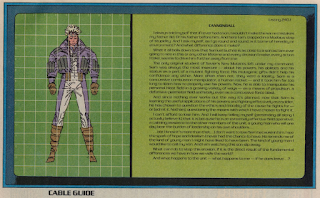 The Cable Guide returns this issue, featuring info on Domino, Cannonball, Warpatth, and Sunspot, though it comes at the expense of the main story (which is shorter as a result, presumably due to deadline issues). 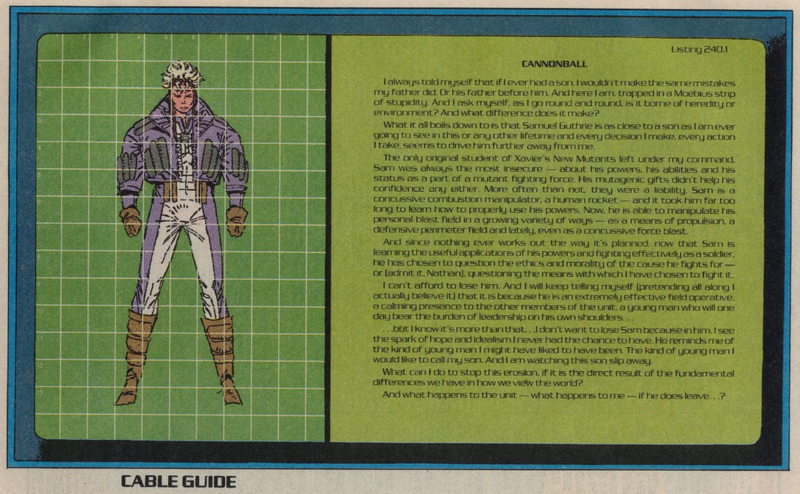 Items of note include Cable not knowing Domino's real name (I believe later stories establish that he does know it at this time), lots of references to fathers and sons in the Cannonball file (playing up the upcoming idea that Cannonball is Cable's whole reason for being in the past), and the notion that given time, Warpath could grow to be as strong as Thing, Thor or the Hulk. 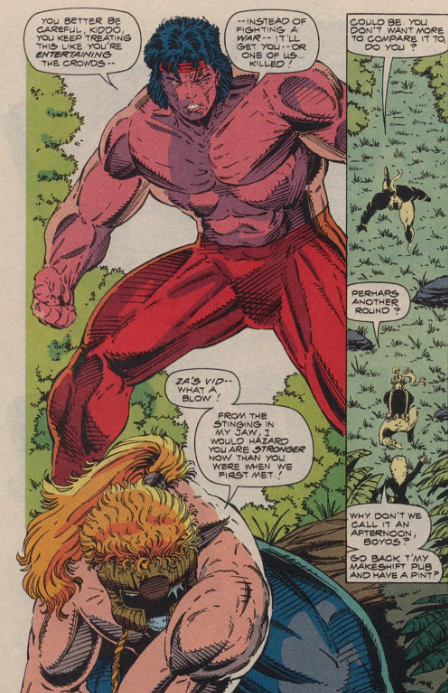 Four issues after it happened, Boom-Boom gives Feral the business for almost killing Sam during the training session in issue #2. It's noted once again that Warpath is growing stronger. 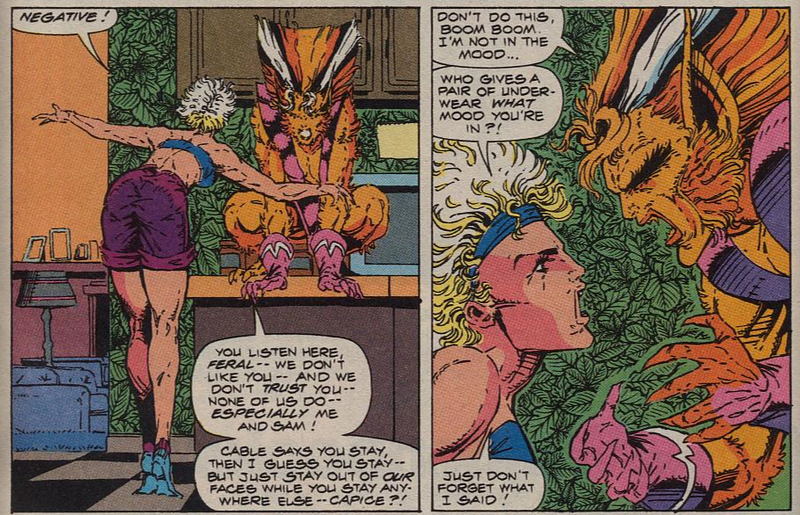 Also, Siryn has apparently setup a pub at the base (which is probably just a one-off bit of dialogue, possibly a joke at the expense of her being Irish, but later issues will establish that Siryn is in fact an alcoholic). The Morlocks apparently learned the whereabouts of X-Force's new headquarters, which is how the Brotherhood knew where to find them. Cable and Domino share a bathtub together, though Domino later appears to be wearing a swimsuit. It's noted that Cable acquires his weaponry from terrorist organization AIM and that he's not too concerned with the ethics of that, an idea that doesn't really go anywhere beyond providing further rationale for SHIELD wanting to bring him in. Cable & Domino's bath is pretty hilarious, with oddly-covered steam (?) swirling about and Domino making oh faces. 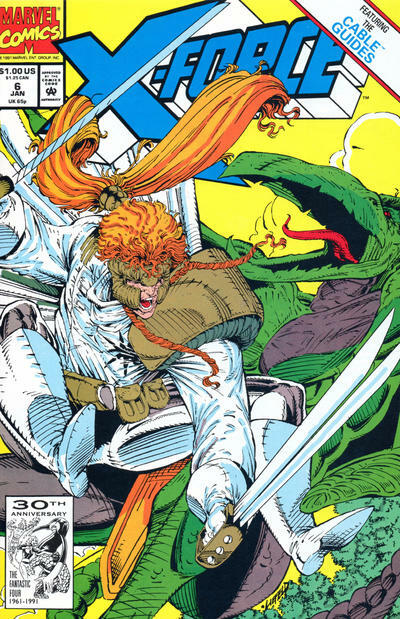 Later, during the Warpath/Shatterstar training session, Warpath's ponytail appears and disappears between pages, while he refers to Shatterstar wielding swords while the character is actually just holding what appear to be two silver rods (which also appear and disappear at random). For the second issue in a row, X-Force mostly just stands around talking and training while stuff happens around them, but this does mark the first official full appearance of the new Brotherhood of Evil Mutants, For all the issues this storyline has (the decompression already on display being chief among them), I do like the idea of reviving the Brotherhood of Evil Mutants. Freedom Force is gone/morphed into the new X-Factor, and Magneto has a new band of followers, so the name is up for grabs. Plus, there's something really fun in the idea of the perpetual-toady Toad being the one to organize and lead the group (even if it doesn't make a whole lot of sense and requires pretty much a complete re-writing of the character for it to work), and the final composition of the group is a nice mix of members from different eras (the original, Mystique's, and new). 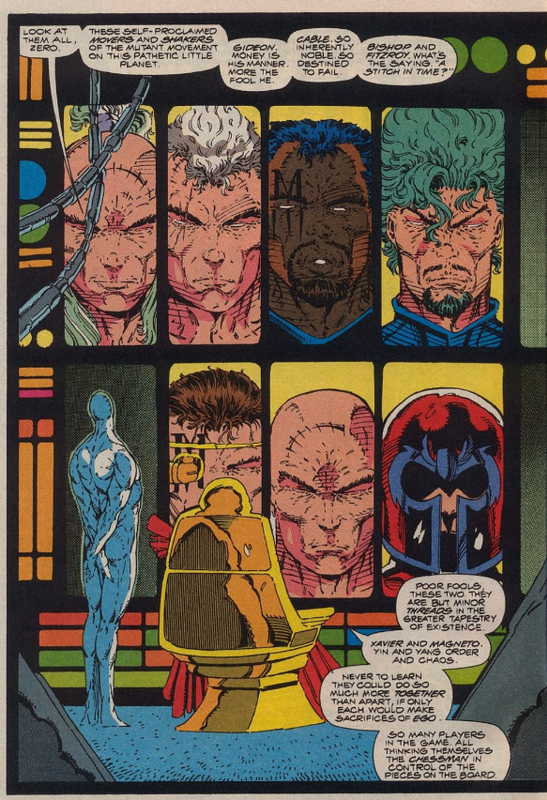 The Brotherhood are the original evil mutant/opposite X-Men team, and the franchise as a whole is better off when there's some iteration of the team in existence. So for all it's all other failings, at least this story gives us that. Tomorrow, Strong Guy wrecks stuff in X-Factor #74. Next week, X-Men #4 and Excalibur #46. There's no other sensible explanation to his fully extended arms but that he's engaging in some serious telekinesis. No way anyone relaxes like that. At least we get some information on the team members. Nicieza is apparently taking it upon himself to tell — via both text pages and story dialogue — since all Liefeld seems willing to show is characters going through the same sorts of motions (or lack thereof) issue after issue, posing and pontificating or sparring and shouting in endless subplot whose significance may be only known to him. I don’t really care where things are going but I do feel bad for the guy having to give these 18 pages a modicum of narrative depth. I have mixed feelings about Nicieza's writing (loved his Warriors and X-Force, lukewarm to his X-men and disliked his Thunderbolts)about he does get props for holding X-Force together during the Liefeld years. [quote]Plus, there's something really fun in the idea of the perpetual-toady Toad being the one to organize and lead the group (even if it doesn't make a whole lot of sense and requires pretty much a complete re-writing of the character for it to work)[/quote]There is a precedent. Steve Englehart had propped up Toad as being technologically adept. In AVENGERS#137 Toad was able to put the team into a trap that knocked out Thor & Iron Man, and severely injured Wasp (however- once his identity was revealed- the team practically ignored him and his ravings). In his VISION AND THE SCARLET WITCH LS, Englehart had Toad unleash robot versions of the original Brotherhood of Evil Mutants in an attempt to crash Viz and Wanda's Thanksgiving party and later held his own against Spidey and Viz wearing a powerful exo-skeleton suit. My first issue of Avengers was #138; Toad — posing as the Stranger, of all people — freaked me out, but then again I was 4 years old (early reader) and so did a lot of other things in the issue.